We're making great progress here in the Maldives as we continue to survey reefs around Lhaviyani atoll. Our 10-12 hour dive days are followed by nights of data processing and organizing. So far, we have had quite surprising anecdotal results. As one would expect, we have found that most of the inhabited islands have degraded coral reefs, and most uninhabited islands have pristine reefs. 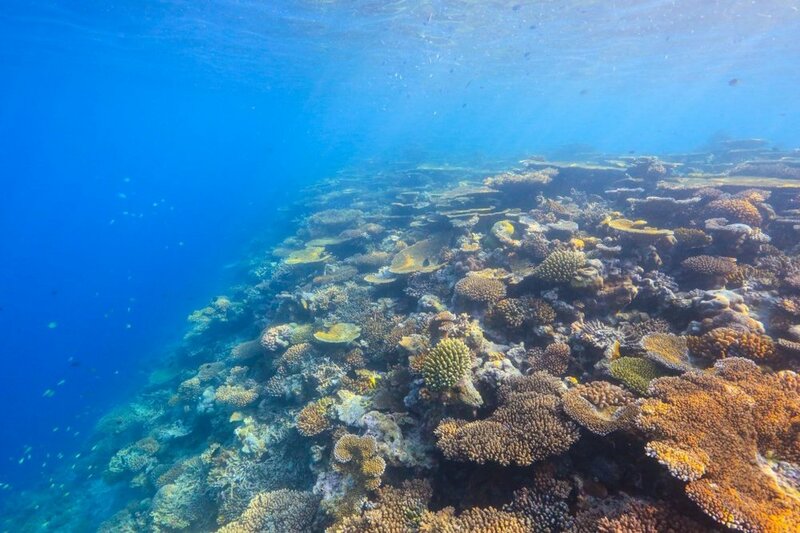 However, we surveyed an inhabited island's coral reefs at the southernmost point of Lhaviyani atoll recently, and observed fairly high levels of coral cover and complexity, despite high nutrient levels in the surrounding waters. We suspect the healthy levels of herbivorous grazers (e.g., parrotfish), are playing the vital role of preventing algae overgrowth. It demonstrates that all parts of an ecosystem are important in maintaining reef health. In addition to showing human impacts on coral reefs, our 3D coral reef imaging methodology is also able to help answer questions that have plagued scientists for decades. We're able to quantitatively measure coral surface area, volume and complexity, all without touching the reef. Above is a table coral (of the Acropora genus) captured in the reef right offshore of Vavvaru, the island where the Korallion lab is based. We recently surveyed our 4th island in the atoll, Naifaru. The capital of the Lhavyani atoll, the island's economy is primarily driven by fisheries. Naifaru is famous for its fishing markets, which is the largest in all of the atolls, with the exception of Male, the city capital. Unfortunately, such success comes at the price of marine health, as much of the coral reefs surrounding the island are dead or in pieces, including once massive table corals. The island now relies on artificial barriers to protect against wave action and erosion, taking the place of now destroyed coral reefs. It costs $4,000/square meter to build such a break water barrier, as boulders are shipped from India. The smell of burning trash lingers as our research team tries to sleep; Maldivians have limited options when it comes to trash. The only options in this isolated island country is to incinerate trash or toss it in the ocean. Problems with waste management are common among island countries, and are exacerbated in more populated islands such as Naifaru. There is hope in the Maldives, however, especially in the uninhabited islands. We finished our day by diving on Veva, an uninhabited island with 100% coral cover, a site described by Hydrous founder Sly Lee as "easily the most pristine coral reef I've seen in my life." The awe-inspiring site mirrors what healthy reefs might have looked like hundreds of years ago. It is a glimmer of hope in this sinking country, and hopefully we can inspire the protection of these last pockets of healthy reefs.